This project helps to understand how and why the known mineral deposits are where they are, and if similar deposits might be found in parts of the Skeena Arch -- including parts of the area of Geoscience BC's Search Phase I geophysical survey, and greater detail in an area 30 km east of Terrace and 75 km southwest of Smithers, British Columbia. Combining complementary data sources into a single map helps mineral explorers, land managers and others to make more informed decisions, and may bring new investment to the area. The new 1:50,000 scale geological map covering the area southwest of Smithers (NTS map sheet 093L/13) will develop a detailed understanding of the local structural controls on mineral deposits. 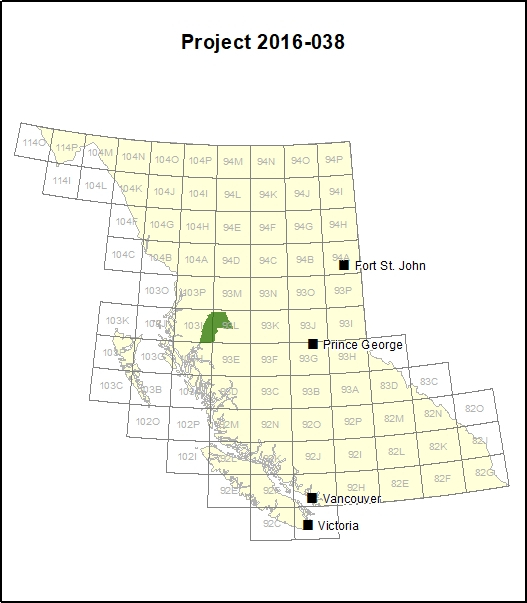 This project compiles data for the greater Search Phase I area and provides greater detail in the NTS 093L/13 map sheet area approximately 30 km east of Terrace and 75 km southwest of Smithers. In 2015, Geoscience BC’s Search Phase I survey mapped the distribution of magnetic minerals below the surface for an area from Terrace in the west to Smithers in the east. In 2016, a field mapping team composed of geologists from the British Columbia Geological Survey and the University of British Columbia’s Mineral Deposit Research Unit (MDRU) compared the Search Phase I survey magnetic data and archive data collected by satellites with materials on the ground. The team identified rock structures that may have provided paths for mineralizing fluids from deep within the earth to move toward the surface and be trapped to form mineral deposits.